These are some very serious cupcakes. You’re almost certainly going to have to go to the store before you can make them. They require you to make your own caramel. You’re going to have to wash a small mountain of dishes. But they are mighty. I used them to bribe people to help me move (it worked); I gave a couple of leftovers to my new mama friend, the one whose baby brought you those tasty, tasty cookies. The mightiness of these cupcakes comes in many forms. First, there’s the one-two punch of melted chocolate plus cocoa powder. There’s the knock-you-upside-the-head richness created by over a pound of butter and the better part of a dozen eggs. But the richness somehow manages to mesh perfectly with a lightly-textured cake, and if you can stop eating the caramel with your fingers…well, you’re a better person than I am. By the way, this recipe is being posted just a few days after I cooked it (not my usual MO) because my Dad specifically wrote to me to ask where it was. And also so that after you eat six of them, you can’t say I didn’t warn you. Adapted from Cupcake Blog. The original is well worth checking out: it has a sneaky method for making a batch that’s half regular and half gluten-free cupcakes, as well as much snappier styling than what I’ve got. Put the butter and cream cheese for the frosting on the counter to soften. 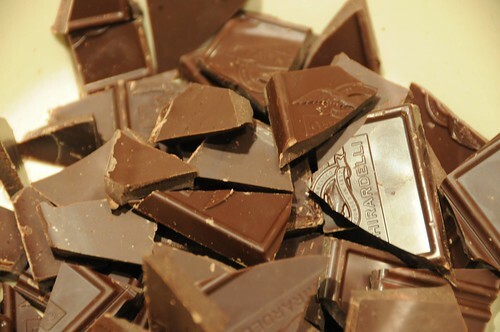 Break the chocolate into pieces, either by hand or with a knife if necessary. Put it and the butter in a large bowl and microwave in thirty-second increments, stirring in between, until nearly smooth. Then remove and stir until completely smooth. Stir in the sugar. Check with a fingertip to make sure the mixture is not still hot. If it is, let it cool for a few minutes. When it’s not too hot to touch, stir in the eggs. I recommend doing this one or two at a time (eight is a lot of eggs) and stirring vigorously until they’re thoroughly incorporated. Stir in the flour, baking soda, and salt. Add the cocoa powder as well, sifting if there are any lumps. Mix until combined. 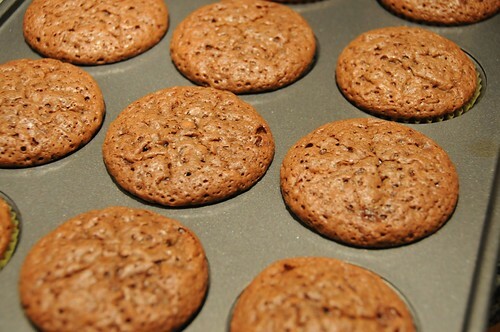 Scoop into lined or greased cupcake tins. Fill the cups only about 2/3 full so they don’t overflow. Bake for 15 minutes, then rotate the pans (at least back-to-front; switch racks if you have them on two) and bake for about ten more minutes, until the tops appear just dry and a toothpick comes out clean. You can make the caramel while they bake! Combine water, sugar, and syrup in a deep saucepan and stir to combine. (I like to use a nonstick pan for easy cleanup, but it does make it a bit harder to judge when the caramel is done because of the dark interior. The “deep” part is the most important one, though!) Put the saucepan over medium heat. Cover and cook for two minutes. Then remove the cover and turn the heat up to medium-high. If the mixture isn’t already boiling, it will start. Cook it without stirring from now on. (This helps keep the sugar from crystallizing.) Instead, you can shake or swirl the pan. You’re just going to cook it until it turns a nice, dark amber. The syrup is already a bit dark, so it can be tricky to tell exactly how this is going. It will boil for some minutes — I’d guess three to five — and then start darkening in color. (What’s happening is that the water is boiling off before the sugar starts to caramelize.) So look for the color to start changing towards darker. But also, don’t worry too much: I under-caramelized mine slightly, and it’s still excellent. When it’s dark amber, remove it from the heat and wait a few seconds, then carefully pour in the cream and stir to combine. The mixture will bubble and steam, so keep your face away from the pot. Remove from the heat and stir in the butter, lemon juice, and salt. Measure out one cup using a metal cup or by pouring it into a Pyrex measure. You’ll probably have a few tablespoons left over; you can pour these on to foil to cool. I just ate mine, but you could use yours for cupcake decoration, too. You’ll need to throw it in the freezer if you want to do this in some way other than drizzling! 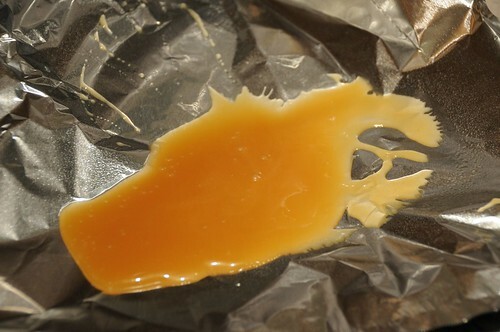 You’ll need to wait until your caramel goes from burning hot to merely warm for this part. Using a hand or stand mixer, beat the butter and cream cheese together until they’re uniform in texture. Beat in the reserved cup of caramel. Then sift in more powdered sugar until you reach the desired taste and texture. 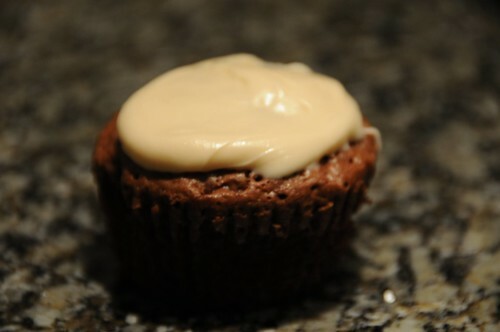 The frosting will get stiffer as you add more sugar, but I found that three cups was about enough for me. It made for a relaxed kind of frosting — it’s spreadable even straight from the fridge — but it was as much sweet as I could take, even balanced with the cream cheese. Frost the cupcakes and try not to eat them all. *This is a time when regular old granulated white sugar, or the closest thing you use to it, is your friend. ***I wildly prefer Santa Cruz Organics lemon juice, which I can also get at my local natural food store, to regular bottled lemon juice. ****I learned this phrase when I was in Britain and I have an unreasonable love for it. But it sounds so much healthier!